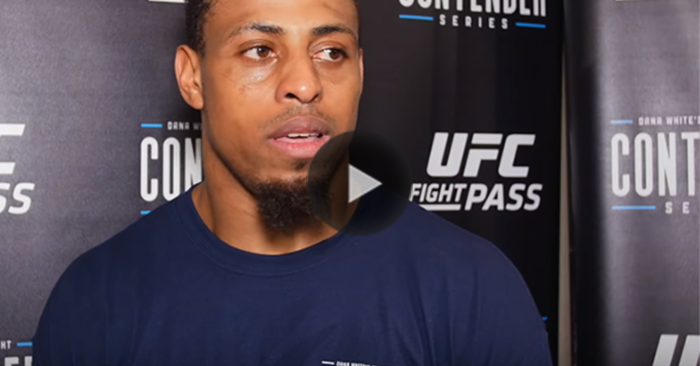 Former NFL star Greg Hardy put on another dominant performance on Dana White’s Tuesday Night Contender Series. Now the former NFL star has come forward with a few words on his fighting future. Greg Hardy first caused controversy when the football player was convicted for domestic violence. Hardy was then dropped from the NFL roster and faced some serious fallout with football fans. Since then, Greg Hardy has appealed the decision and had the charges dropped. The former NFL player had begun a budding career within the sport of mixed martial arts. Most recently, Hardy made his sophomore appearance on Dana White’s Tuesday Night Contender Series. This time around, Hardy earned a first round TKO victory over Tebaris Gordon. Speaking to TMZ Sports, Greg Hardy revealed that he has no intention of returning to the NFL. “I’m not putting any brakes on the UFC movement, man. I’m going all in with it. I’m not a crazy man. I’m not going to turn down anybody’s $10 million or $15 million dollars. But, I can’t see myself stepping off of this path.